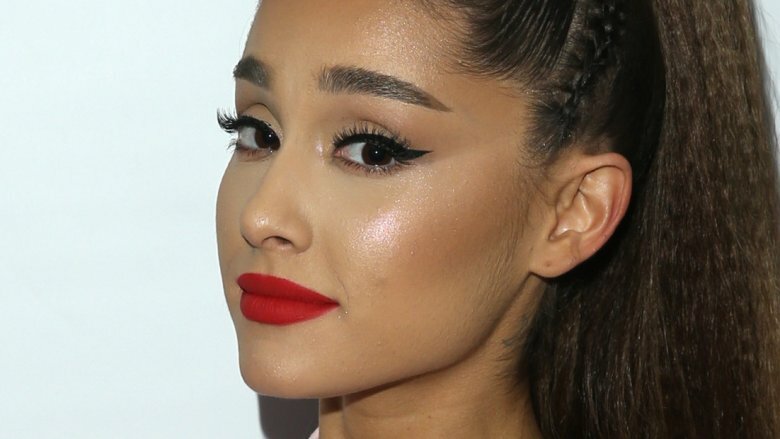 Singer Ariana Grande has a lot on her plate. Just hours after Grande took to Twitter to slam Grammys producer Ken Ehrlich on Thursday, Feb. 7, 2019 (via Elle), she released her fifth studio album, Thank U, Next, as noted by CNN. The 12-track record reportedly covers many emotional topics for the pop star, including her breakup with Saturday Night Live star Pete Davidson and the death of her ex-boyfriend, rapper Mac Miller. In particular, as noted by BuzzFeed, some fans speculated that the track "Ghostin'" is about Davidson not being able to comfort Grande after Miller's death in September 2018. Miller reportedly passed as a result of mixed drug toxicity. "I know that it breaks your heart when I cry again / 'Stead of ghostin' him," she sings in one verse. The heart-wrenching song continues, "Though I wish he were here instead / Don't want that living in your head / He just comes to visit me / When I'm dreaming every now and then (And then)." Although Grande hasn't confirmed any of the rumors about her new songs, one thing is clear — she doesn't have time for producer Ehrlich's explanation regarding why she won't be performing at the 2019 Grammys. The drama started after Ehrlich told the Associated Press on Thursday that the songstress supposedly pulled out of the event because she "felt it was too late for her to pull something together for sure." As for Grande's response? She accused the producer-director of "lying" and blamed him for trying to curb her artistic vision. "I've kept my mouth shut but now you're lying about me. I can pull together a performance over night and you know that, Ken," she tweeted. "It was when my creativity & self expression was stifled by you, that i decided not to attend. I hope the show is exactly what you want it to be and more." Grande, who is nominated for two Grammys, added, "I offered 3 different songs. It's about collaboration. It's about feeling supported. It's about art and honesty. Not politics. Not doing favors or playing games. It's just a game y'all.. and i'm sorry but that's not what music is to me." The Grammys will take place on Sunday, Feb. 10, 2019, starting at 8:00 p.m. ET.